Our rescue program handles the cases that our Mobile Clinic cannot because the animal needs 24 hour care. 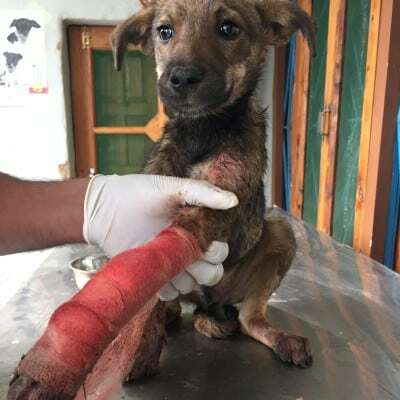 Every day we respond to calls on our helpline to come to the aid of animals injured after being hit by a vehicle, to severe wounds, illnesses, burns, etc.. Most cities across India don’t have helpline, a hospital, or a shelter for suffering street animals. 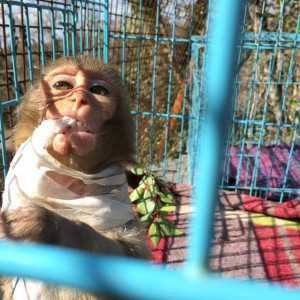 In those places, animals must suffer without any help and possibly die slow painful deaths. We receive calls from places outside of Dharamsala but unfortunately, we only have the funds, space, and manpower to barely keep up with the issues in our own city. To see more, check us out on Facebook. 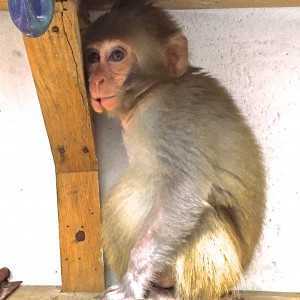 Sheru was approximately 8 weeks old when we received a call that he had been run over by a car. He leg was completely smashed and we needed to do an emergency amputation. He is such a sweet guy and we all fell in love with him. His recovery was quick and soon enough he was coming on our daily hikes with the rest of the dogs. Sheru was lucky enough to be adopted by a nice monk from the Sarah College where he now attends classes with the students, hangs out at the women’s hostel, and gets taken on walks to a river where he can swim! Sheru was lucky enough to be adopted by a nice monk from the Sarah College. 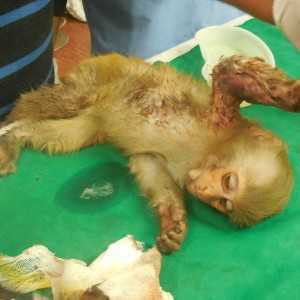 Bali, the baby monkey, was hit by a car. None of us had ever spent so much time with a baby monkey. We had to amputate his smashed limbed but he learned to trust us, let us feed him and play with him. We were hoping we could keep him but we knew he needed to be back swinging in the trees. We also knew that monkeys started throwing things at people as they got older, as Bali started to do! To see the full story of Bali, check out this video HERE. Thank you so much for caring for our animals and people.